When I think about intellectual and artistic innovation in Nuku'alofa, I imagine a triangle laid over the city. One corner of the triangle is in Sopu, on the swampy western fringe of Nuku'alofa, where the 'Atenisi Institute has its campus; another is in Fanga, close to the central business district, where the actors, painters, and dancers of the On the Spot collective plot and exhibit in a renovated cottage; the third corner of the triangle is in Haveluloto, in the northeast edge of the city, where the members of the Seleka Club drink kava, draw, and paint in their wildly decorated lagoonside hut. Yesterday I visited each corner of the Nuku'alofa triangle. At 'Atenisi I saw the new shelving that had just arrived from Victoria University, shelving which will help complete the refurbishment of the institute's two-storey library; at On the Spot's headquarters I found Ebonie Fifita and her friends at work on their laptops, planning their contribution to Tonga's upcoming Mahina festival. Ebonie took me into the yard behind On the Spot's cottage, told me about the play her group had performed recently in Guam during the Pacific Arts Festival, and pointed to the stretch of rough earth where she wants to raise a great fale that will contain art studios and space for visitors. 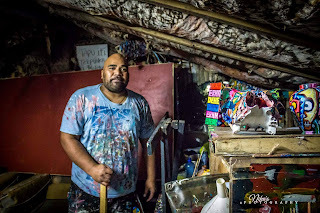 Late in the evening I found Tevita Latu, the founder and leader of the Seleka Club, relaxing on a couch in his kava house after a day spent building a stage in downtown Nuku'alofa. Tevita and young members of the Seleka Club undertake all sorts of mundane jobs, as they raise money for art materials and exhibitions and trips abroad. As some young club members snored on nearby couches, Tevita told me about the residency he and his fellow Selekarian Taniela Petelo have next month in Wellington. He showed me some leftover paintings from the club's recent exhibition, but explained that 36 of the 43 works that had been exhibited had sold. As I went from 'Atenisi to On the Spot to Seleka, I felt the energy humming through Nuku'alofa's creative triangle. You can connect with the Seleka Club and On the Spot on facebook. What puts me off Tonga and Samoa and even parts of Panmure where I am is my deep fear of dogs. I would consider going there even if to see Atenisi and a few things you mentioned...I might. I haven't got a passport but I suppose I should also get one as I have never been to Australia where my brother has lived for years...hmmm...well...if I do the plastic will have to take a thrashing!